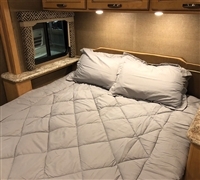 Here you will find Byourbed's selection of RV Comforters. Your RV bed is where you rest and rejuvenate for your next adventure, so you want the most comfort you can find. Getting a quality night's sleep every night is important and you need comfortable RV Bedding in order to do that. Here you'll find the RV Comforters you need to make your bed comfortable. Plus, this exclusive Byourbed item, you will be confident that this RV Bedding will fit your unique RV bed.